As we announced last week, we are proud to be involved with the National Association of Government Defined Contribution Administrators Inc. (NAGDCA) Conference. On October 1st, 2012 San Diego will host the 19th Annual 5k/1-mile Fun Run/Walk sponsored by T. Rowe Price and directed by our very own, Blake Miller. 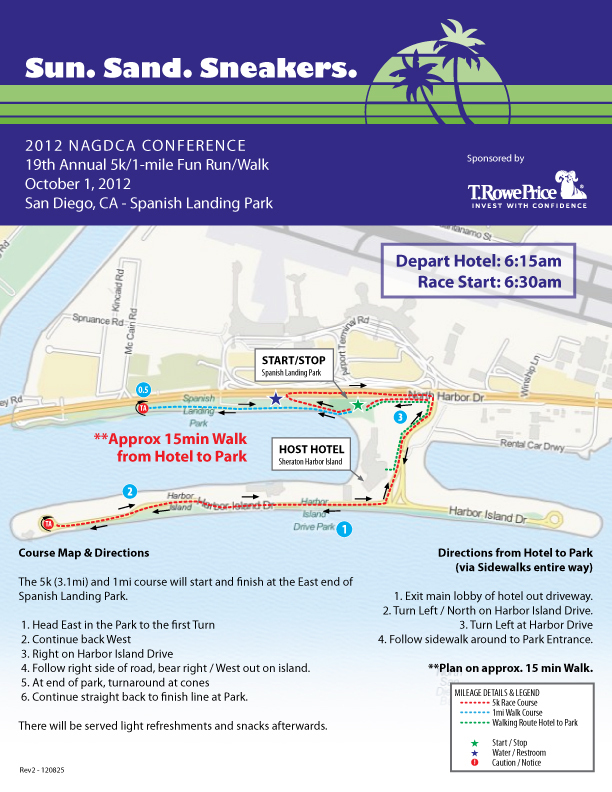 Part of our services for the NAGDCA Conference was to design both the 5k and 1 mile courses to the start/finish at Spanish Landing Park. The course expands all the way out to Harbor Island, giving runners a great opportunity to explore San Diego at it’s finest! Also, us at Run San Diego provided unique graphic design services for the NAGDCA Conference. An eye-catching and informative map of both courses has been designed and produced for the race to pass out to the competitors. For more information on the race details and location please visit the blog post below.